I brought my vacation to a close with a paddle down the Rainbow River in Dunnellon. What a lovely way to go! This crystal clear river is a favorite of both tubers and paddlers. The river begins at the springs in Rainbow Springs State Park and runs for about seven miles before it joins the Withlacoochee River. 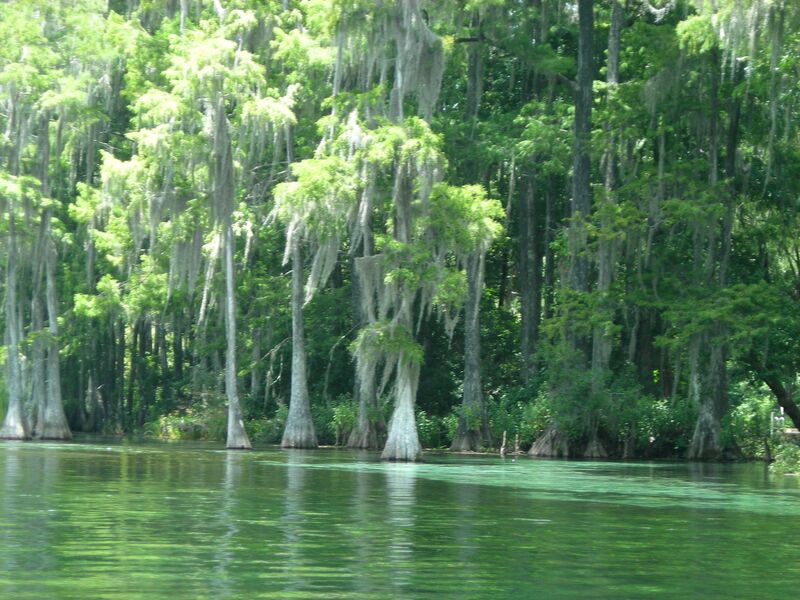 Although paddlers can start in the state park, many access the river at KP Hole in Dunnellon. From there, they can paddle upstream the mile or so to the springs and back before completing the 3.6 mile stretch between KP Hole and CR 484. I paddled on a Tuesday, and I was one of the few kayakers on the river; tubers were abundant! I paddled the stretch between KP Hole and CR 384, expecting it to take me over two hours. However, I was finished in 1.5. I feel as if I cheated! Regardless of the length, it was a fun paddle. I saw my first otter; he was swimming in the water to the left of me, little bothered by all the people on the river. For that matter, none of the wildlife seemed bothered by all the people in the water. The ibis and egrets watched from the sidelines while the cormorants stood on the rocks in the water, flapping their wings in time with the water fun. Anhingas crossed in front of me, their long necks like snakes in the water, slithering about. I floated and paddled with the current; to the left of me, the bank was lined with trees while to the right, the bank was lined with homes. Homeowners seemed accustomed to having tubers and paddlers floating by in their backyards. So, after two weeks, my vacation was over, and I packed up my car and headed home. Rather than sadness, I was feeling excitement and exhilaration about the journey I have begun and the many Florida river adventures still waiting for me. Isn’t the Rainbow River beautiful? I love it! The KP Hole at the mouth (?) of the RR was a tourist attraction much like Silver Springs down the road in Ocala. It had been abandoned in the late 70s when a certain attraction in Orlando (the name escapes me…) began drawing more tourists to see artifical (i.e. man made) wonders rather than natural ones. A friend’s parents from Jacksonville owned a vacation a stone’s throw (okay, a small stone, thrown very far) from the old Rainbow Springs site. It was only half-heartly patrolled by a private security service, and one could pull a boat into the park, dock and explore the ruins. There were the remnants of old animal exhibits, abandoned rides, and a couple of sunken glass-bottomed boats. Plus a few artifical waterfalls…it was quite beautiful. It reminded me of ancient ruins that were more beautiful in disarray that when in use…I took quite a few photos of it back then. In the early 90s, a senior living community purchased the property and turned it into a park of sorts, restoring some of the buildings and the natural beauty of the grounds. There’s now a large sandy beach area where for a small fee, people can go swimming and picnic there. It’s one of those hidden treasures of Florida.